This was a hunt that took place on the Alaska Peninsula on Federal Land. 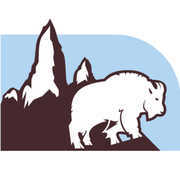 It is a private concession where I Guided Brown Bear Hunts for Alaska Outfitters. The Alaska Peninsula is one of the last wild uninhabited territories in Alaska. 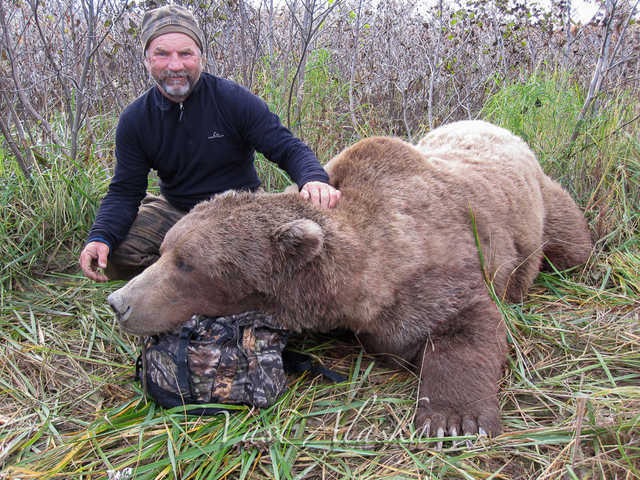 Terry Hagman, an Alberta based outdoorsman and I, We were in search of an exceptional bruin. Over the course of the hunt we had a pack of wolves sweep our valley and bay up four moose in a pocket of beaver sloughs. The wolves were particularly targeting a newborn moose calf. For days the moose could be seen down valley, bottom feeding water grass from the sloughs or fringe willow on the edges. We were in wait for one particular Bear, which we saw early on in the hunt. He came out to feed just before sunset, down wind of us. It was a brief meeting, all it takes for a mature bear to vacate the premises is a notion that there is presence of man. Then they will find other habitat or take to the nocturnal hours. Storms pass and time flies watching the social structure of the numerous bears in our vicinity. We stalked a few 9 foot bears and gave the area ample time to recover from our first meeting with the bruin we sought. To no avail, we finally pulled up the tent stakes and headed down valley towards the beaver sloughs. From a elevated creek bluff as the sun began to rise a 8 foot adolescent was feverishly digging in a riverbed. The object of his desire was the ROE that eddied out there from spawning salmon. It wasn't long until a formidable Sow and her two yearling cubs showed on the bank downriver. She sized him up and meandered downwind in the brush to get a better idea of whom he was. The scent acquired would tell of his identity and his intentions. Once that was established she re-appeared and gave him a bum rush. Cubs in toe her heavy pads warned of her presence and the 8 foot adolescent took off in a dead run. Accomplishing her objective, she slowed to a lope and one cub in particular kept up the hasty pace and continued around the bend running the bear off. He returned full of pride to the ROE hole with the rest of the family. Comedy at best. We watched the world turn, Fox, Caribou, and Life in general made a worthwhile spectacle. Surprisingly our Bruin parted the brush and bumped the Sow family out of the ROE hole. Deftly we reacted and put a fine stalk on the Dominant Bear. Despite a fine shot he gave a final bound into the thick of it. I make a habit of extreme caution regarding tight spaces with dangerous game (Although i don't consider Brown Bears dangerous until you inflict a reason for aggression). Looping around to the downwind side of the point of the Bruins entry into the brush we scoured for sign of his whereabouts. If you use your binoculars even in the brush it is the equivalent of a detective with his magnifying glass. You can pick up signs of blood or a patch of hair from a lying bear and still maintain a berth to react. Bears find their security in tight womb like places. We pinpointed the Bear, he had passed his last breath. Late in the day around 1am we finally had his clothes off. This was a large specimen of how the wild things grow. It was too dark to be packing heavy hides in the brush and hummocks so we pitched a fly and put a boil of water on and got ready to sleep off the night. I woke from my rain gear tomb with whispers from Terry, "There's Wolves on all three sides of us". Sure enough, there was, a stones throw away in three directions wolves were baying something. I wasn't fearful of us being their interest, and it seemed a little early for wolves to get on the carcass. Daylight came to play and we headed out back to main camp. En route we were greeted with an inquisitive cow moose, mewing for her lost calf, in despair. Raw and beautiful the symbiosis of one of the last wild uninhabited places.